Printable Black & White PDF Printable Color PDF More Paper Dolls & ClothesOn Monday, I posted some 1930s dresses, but paper doll dresses aren’t much use without a 1930s paper doll to wear them. So, here is Benedita, being a 1930s paper doll today! 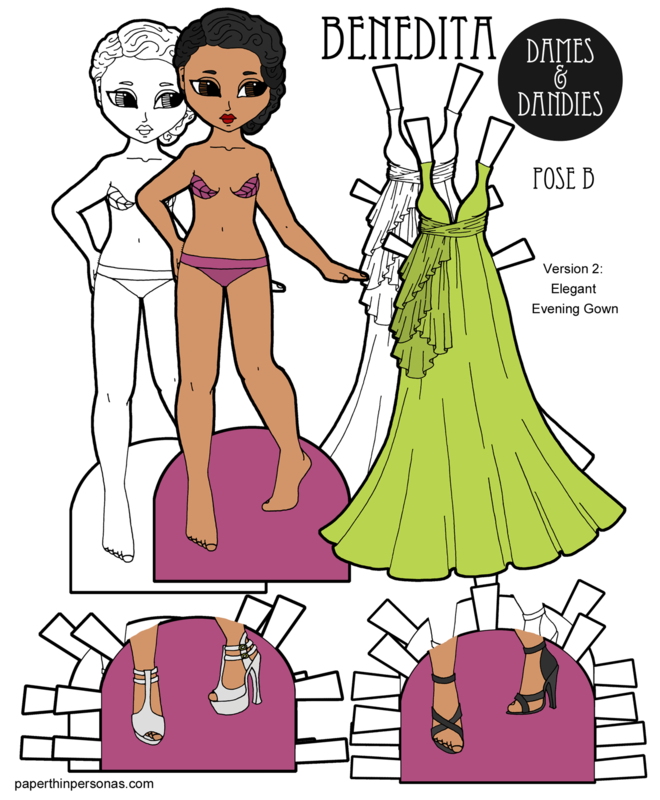 Never has the “dames” title for this printable paper doll collection been more fitting. Benedita’s 1930s corset was based on this one from The Met. The original corset has a ruffle at the bottom. I had drawn it that way, at first, but to make the slim skirts of the 1930s work over the ruffle was basically impossible, so through the Power of Photoshop, the ruffle went away. Sometimes, paper doll creation requires editing changes, because fabric can fold and paper… doesn’t. The shoes all came from 1930s shoes in different museums. I love 1930s shoes, but I wanted to try to focus on classic designs that would be versatile for different outfits. Her brown shoes, for example, were based on this pair of purple shoes from Saks Fifth Avenue crica 1934. Her green shoes are a simplified version of this patterned pair from 1935. Her beige and black pair were based on this pair of French sandals. The black pair of the doll is wearing come from this pair of shoes, which is also black. And yes, today’s 1930s paper doll is wearing shoes. Why? Because I thought it would be easier to put her in shoes than deal with the fact that she can’t be barefoot (she’s wearing stockings) and I didn’t want to deal with the whole “toes under stockings” thing. So, the solution? A nice neutral pair of black shoes. Now, just like my 18th Century Alice, 1930s Benedita can’t wear all the clothing I’ve ever drawn for the B Pose paper dolls without her underthings showing. So, if she does decide she wants to go slay a dragon in this ridiculous get up, than she may need need to be okay with her corset showing. Or you can always cut her head off and paste it onto another Benedita’s body. It’s a little gruesome, but no one will judge a bit of paper doll decapitation. Love her? Hate her? Have an opinion on what decade I should do next? Let me know in a comment! Meet Benedita! The second of the B Pose paper dolls. I knew from the start that Beatrix was going to be named Beatrix. She just looked like a Beatrix to me. And then I had to decide what to name the second B Pose paper doll which wasn’t easy. I knew I was going to give her another B name, but I had trouble picking one. Finally I settled Benedita, because I’d already decided that she was a Latina paper doll. Why had I decided this? Because I thought it was important to start the new series with a variety of different skin-tones and ethnicities. Plus it allowed me to name her Benedita and make a Much Ado About Nothing connection. Benedita is a Portuguese feminine form of Benedict, meaning blessed. It’s also, apparently, a popular name in Brazil. Benedict (or Benedick) is also the name of the male lead in Much Ado About Nothing. My first B pose paper doll was named Beatrix (as you may recall) and that is the name of the female lead in Much Ado About Nothing. So, clearly, I had to name the second paper doll after the male lead in the play. Slightly convoluted, yes, but my mind words in strange ways sometimes. I was super sick last week with… well, the Doctor wasn’t sure. The flu test was negative, but whatever it was knocked me flat on my back for the whole week. I’m slowly recovering. I hate being sick. Assuming I get everything done, there will be a new A pose doll named Akiko on Wednesday and then on Friday, the 2018 Paper Doll Collaboration gets to debut. Let me know what you think of Benedita in a comment or anything else you’d like to share.